There are some forms of knowledge that can be imparted verbally through instruction. And there are some forms that can be demonstrated. But here we will make no assumptions that what is seen is understood in the full sense of the word. Yesterday we had a new student visiting wood shop hoping to attend Clear Spring School for the balance of the year. But her family must move first. I asked my students what project they would recommend that could be done in a day, so that the new student would have something to take home. They all insisted that work on the lathe would do. One student volunteered to help her to get started. That was also a learning opportunity, for once you have done something, to watch others try the same thing makes what you've already done make more sense. It provides the opportunity for reflection. They say that if you really want to learn something, try teaching it to another. It's true. Watching over 4 lathes working at once can make one nervous. But in my case, I know what to look and listen for. Long hair and loose clothing must be constrained. Sleeves should be rolled up. The face mask should be used even when just sanding, and hand position on the tools should be carefully checked. Most of the balance of the teacher's work is simply watching, listening and checking in. You can tell from the sounds of the student's work whether the tool is sharp and whether they are applying too much force. So this is one area of teaching tool work where the teacher had best have his or her own experience in the work. I cannot exactly describe the sounds to listen for, but I can tell you to listen, and to use all your senses, even and most particularly those that cannot be put in words. When you have gotten reasonably good yourself on the lathe, you will know the sounds that are made when things are going right. All else is warning. Yesterday the editorial process on my box guitar book began with emails from Kerri, asking me to resend particular files that have been misplaced or not immediately at hand. Making sure that she has all that she needs for the next steps will be my plan for the day. In the illustration above, and for convenience I divided the dark and light into two halves. What we do and know and and share verbally describe is actually a far smaller portion than half. Nails seem to be one of the simple things we take for granted, and it may seem silly to write such a long post about them. Made of steel wire, they are used to join pieces of wood. They are easier to use in softwoods like white pine, spruce or fir, as harder woods like oak, cherry, walnut and yellow pine tend to bend them before they are driven fully home. You will have some luck nailing some of the softer hardwoods. For instance basswood is soft enough under most circumstances to be successfully nailed. You can also nail the harder hardwoods, but you must pre-drill the nail holes first, giving the nails a path to follow into the wood without splitting or bending. In old houses, you will sometimes find square forged nails holding together oak full sized 2 x 4s.Those nails were driven into green wood in which the cells were still soft and pliant, allowing the nail to enter. Once the wood is dry, the nails are held fast. And you would never be able to pound those nails into fully seasoned oak. A nail should be long enough so that over half up to 2/3rds of it's length goes through the first board into the one to which it is being attached. For example, to nail through 1/4 in. thick stock and to attach it to another piece of wood, the ideal length of nail would be 5/8 in. to 3/4 in. Nails longer than that tend to go astray, and shorter than that may give insufficient holding power. Of course the exception to this rule is when nailing two boards flat to each other, in which case the nail should be selected so that it does not go through both boards. My youngest students like to just glue things together, but that tends to give a fragile joint. Some students on the other hand, love the challenge of nailing things together, even at odd angles, but often nails are made more effective if the wood is also glued. I sometimes have difficulty getting my students to do both. Effective nailing requires effective observation. The drawing above is to illustrate an important point in the anatomy of a nail. Anyone who has actually tried to hammer nails will have learned that they can either bend as they are driven, or if poorly placed can split wood. There is one little secret to nails that many of the finest carpenters will not know but that can keep you or your students from splitting wood. To make use of this secret requires close observation of each nail as it is positioned to drive into the wood. When nails are made, wire is pressed between two dies that form its head and point. The process leaves a small mark across the top of the head, and two sharp edges at the point on opposite sides and parallel to the mark on the head. These sharp edges when properly aligned cut into the grain, allow the nail to pierce the wood without splitting if the sharp edges are positioned at a 90 degree angle across the grain. 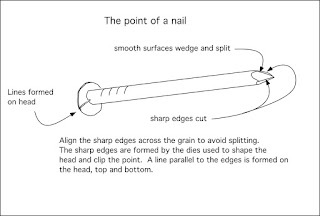 If the nail is positioned so that these edges parallel the grain, the point of the nail works as a wedge splitting the wood. On very small nails like those used by kids in woodworking projects, the line at the top, and the tiny edges require close scrutiny. The edges are also sharp enough that you can determine proper orientation by feel. Learning the value of close observation is one more thing that students can learn in wood shop. This can be presented as a lesson on the value of close observation. Students can test the theory themselves to see if the lesson is true. 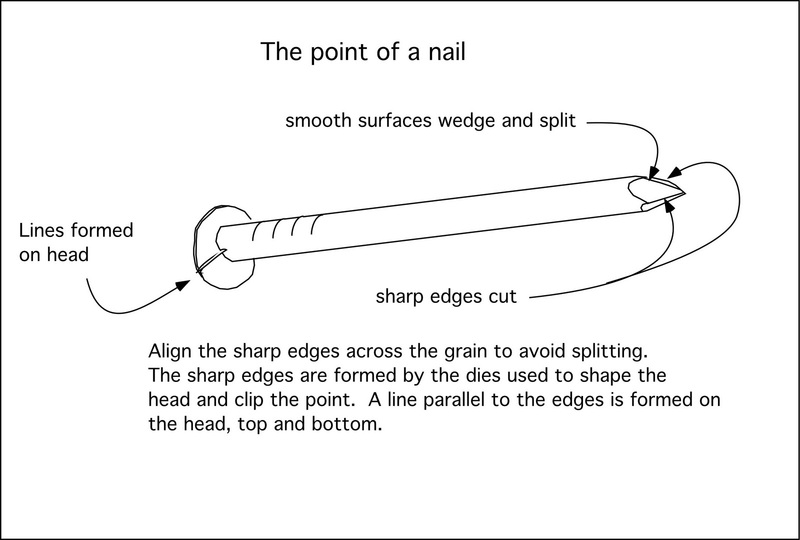 This lesson goes with the illustration above, and there are other fine points in the use of nails that can be discussed. While we tend to learn a few things over time without them necessarily entering the verbal domain, bringing ideas forward into language allows them to be shared with each other. Make, fix, create and share an understanding that we all learn best likewise. Yesterday I finished the Infinity Dovetail Spline demonstration box and got it packaged for shipping to Fine Woodworking. I also designed a new work bench for the Eureka Springs School of the Arts. 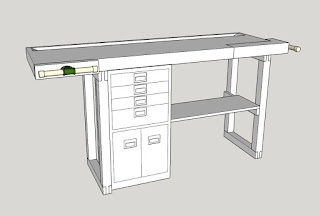 The idea of this bench is that the metal tool cabinet provides both stability, and a place to keep necessary hand tools. This is not the final version of the design, as some changes will be made as the need becomes clear. Also, construction details need to be put in. The leg assembly technique is the same that I used on my own bench, with the joints formed through the use of overlapping stock. With the design being in Sketchup, I can make changes without having to start anew. Eleven benches will be required. It occurred to me that at some point I need to discus nails. Nails are not generally a point of discussion for "fine" woodworking. But choosing the right nail and having it available when working with kids using softwoods requires an understanding of them. It may take me a couple days to pull together what I need to say about nails. Nails are not quite as simple a subject as they may appear. Make, fix, create and activate your interest in advocacy, that others may be lured to learn likewise. Yesterday my high school students began playing with veneers to make top panels for boxes. There is an aspect of the Dunning-Kruger effect that suggests that those who know how to do things, underestimate what they know, thus making the erroneous assumption that what they can do is also easy for others. I found that what I do, though easy for me, may not be so easy for some of my students. I assured my students that though they may have made a false start, they are welcome to begin again. In my review of the Infinity Dovetail Spline system I have worked on a second and third box, and have thereby learned just a bit more about it. And yet, in schools, the value of repetition is seldom stressed. Children are encouraged to have a "been there, done that" attitude that will not serve them well in real life, for practice does truly lead to better if not perfection. I also launched a conversation with my high school students, asking, "Between boys and girls, which gender is more encouraging of each other?" I have noticed that some students are reticent to admit liking things at various times, as to do so would encumber them with the judgment by others of being uncool. The fear of being adjudged uncool, can squelch ambitions and progress. I told them about my weight lifting group in which each of us sincerely encourages each other's efforts. Perhaps I can help the boys to be more helpful and encouraging to each other, as all immediately recognized without question that the girls had greater capacity for encouraging each other than the boys. Recognition of what we do (or don't do) for each other is the first step in bringing change. The box is made from spalted sycamore with a burled walnut veneer on top. The dovetail spline joints were formed using an Infinity Dovetail Spline system. Make, fix, create and increase the probability that others learn to learn likewise. Jill Jonnes' book Urban Forests describes the efforts of non-profit associations of the tree loving kind to set a monetary value on trees, measuring their beneficial economic effects on the environment thus attempting to measure their net worth in dollars and cents. Sense might be a better measure than cents. Today I am back in the forests of Northwest Arkansas, but yesterday as I walked toward Riverside Park from 95th and Broadway, I captured the image of a tree that had captured construction debris directly from the air. I took that image as symbolic of the important economic role that trees of all species play in cities. Much of what trees do, we cannot see. They remove particulates, harmful chemicals and carbon dioxide, while returning oxygen to the air. They remove and help manage the amount of urban runoff from storm water. Environmentalist have felt an urgency to put monetary values on such things largely because there are those who are too insensitive to perceive the other values trees impart to the urban environment. Putting things in dollars and cents, a single tree can pay back thousands of dollars, in return for a only a hundred or two invested in its planting and care. Imagine an urban landscape devoid of life affirming trees. Their effects on the human psyche are also real. Trees are essentially selfless, giving their all without a moment's hesitation to the betterment of the planet, while some men, in contrast, ruthlessly take all that they can, careless of their effects on other people and the planet at large. The other image is of a honey locust tree. They are noted for their thorns and long seed pods.While the thorns might make them unattractive to some and the seed pods a nuisance to others, they are noted for surviving in urban situations. This one is in Riverside park. In its 40 or 50 years of life, it has given thousands of dollars in benefits (measurable and immeasurable) to the city at large. René had asked in a comment below if there is any particular reason that woodworking should be promoted in schools over some other particular craft.The fact that wood connects students to their own natural environment is but one. Make, fix, create, and assist others to understand the necessity of learning likewise. Last night we attended Amateur night at the Apollo Theater in Harlem. The talent was wonderful, the host funny and talented himself. It is a tradition for entrants of all ages to rub what's left of the tree of hope, a section of hollow elm left from a tree that had stood years before in front of the Lafayette Theater which also had hosted a talent night. It was amazing to be in the theater that had meant so much to so many early performers. Dionne Warwick was in the audience. The Apollo is still playing a similar role today, by giving young ones their first chance on stage. Each performer coming on stage was careful to rub the stump for good luck. And it can be assured, that trees do have a special place in the world of luck, as we would all suffer without them. The tree from which the stump came had not had such good luck on its own. It was likely a victim of Dutch Elm Disease, and was notably hollow. Today we head home to Arkansas. My wife, my daughter and I went to the 911 museum yesterday and outside on the museum grounds, I looked for the Callery Pear tree that had been rescued from the 911 site in the days after September 11, 2001, broken, uprooted, and yet showing signs of life. It was dug up, nurtured back to health, and has been replanted on the site. I was made aware of this tree by the book Urban Forests by Jill Jonnes. 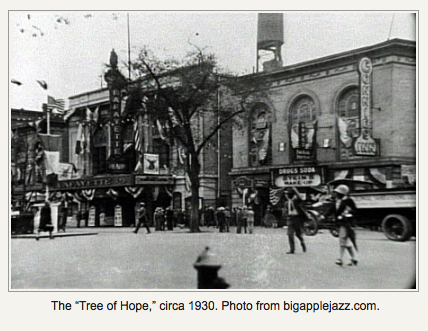 The tree became a symbol of hope, renewal, healing and survival during a major international crisis, the repercussions of which are ongoing around the world to this day. There is a seedling program that provides seedlings raised from this "survivor tree"to communities that have suffered tragic loss. The tag in the tree identifies it as one of the artifacts recovered from the 911 site. As I've seen in the news, Trump attacked the news media as un-American and "enemies of the people." I'm not sure where he gets his ideas. I, like so many others am troubled. One cannot attend the 911 memorial without thinking about the sacrifices real Americans make each day, and not only during times of greatest national trauma. Dana Milbank in the Washington Post, wrote an editorial: These are the American people Trump calls enemies of the American people. Whatever Trump thinks or spews, the members of the media are true patriots. Yesterday my wife and daughter and I attended the #notmypresident day rally at Columbus Circle in New York City. We joined with thousands of others challenging the legitimacy of the 45 president. On the way, we walked past the Ethical Culture Society building on 5th Avenue. Some of my readers may recognize the name Felix Adler, founder of the Ethical Culture Society and the Working Man's School. Adler was a proponent of manual arts training for all children. He was also instrumental in bringing Kindergarten to New York City. If you use the search block at upper left and type in "Adler" you will find earlier posts complete with quotes from Adler's book The Moral Instruction of Children. He recognized the importance of manual arts training, even for those children who planned to attend college, as the hands were applicable to learning in every subject. The use of the hands in service of others is the foundation for moral behavior. Have you heard of the word "craftsmanship" and wondered what it entails? If you've missed the point that it involves values, character and morality, please allow me to invite you to deeper reflection on the subject at hand. If we want students to be good and smart, or smart and good, there can be no better means than by the reintroduction of wood shops to our nation's schools. In conventional schooling, children are instructed to believe this or that and are tested on it. In the schools we need to support Democracy, children will test and challenge themselves by DOING meaningful things for family and community. Some of that should include making beautiful and useful things from wood. It may appear to some, particularly those of an academic persuasion, that thinking is just a head trip. It may be for some, but it you are involved personally in the real world, it's not likely that all of your thinking process would be in your lonely old noggin alone. With all the turmoil in our world of late, I have been reading John Dewey's book Democracy and Education. In it, in attempting to describe the ways in which education may be used to sustain a democratic society, he describes the essential relationship between actual experience and effective learning. An individual must try, in play or in work, to do something with material in carrying out his own impulsive activity. This is what happens when a child begins to build with blocks, and it is essentially what happens when a scientific man in his laboratory begins to experiment with unfamiliar objects. Hence the first approach to any subject in school, if thought is to be aroused, and not words acquired, should be as unscholastic as possible. Jean and I are in New York to spend time with our daughter over Winter Break. Make, fix, create, and insist that others learn to think likewise. Infinity is a long way off. But the infinity dovetail spline system is easy to use. I began my testing of it today by adding dovetail keys to a box. I used a 8 degree dovetail bit to rout the spaces for the keys to fit, then after installing walnut keys, I used a smaller bit to rout the space for contrasting cherry dovetail shaped keys. Testing this system was suggested by my assistant in my box making class at Marc Adams School of Woodworking. I arranged with editors at Fine Woodworking magazine to do a review, and this box, when complete, will be sent to them for photography, unless I choose to do another like it. It would have been easy to understand how the jig operates, but it makes more sense and provides greater truth for me to test it in my own hands. My own credibility as a woodworker is placed on the line. If I do not test it in my own hands how will readers trust what I say about it? The same is true in the political arena as well. We live in an awkward time in which people choose to believe one way or another without considering actual evidence. That is a dangerous state of affairs. We have been conditioned for it by having religions in which membership is based on faith in the unseen and unknowable. So a willingness to keep coming back to the hands, to test things in real life and form opinions based on actual evidence and not on what you have been told and expected to believe is crucial to the preservation of democracy. Yesterday I demonstrated making veneered top panels for boxes and my high school students are now enthused about making boxes using these techniques. Doing my demonstrations for two classes, I came up with 6 different top veneers, and when one had chips torn out in an obvious place, I experimented with using hole punches to add repair pieces that will also serve as additional accents. I had used a paper punch previously to add small accent dots in fields of veneer but the full set of hole punches offers a variety of sizes. Manual arts training for all students is important for the society at large. To borrow 19th century terminology from Jonathan Baldwin Turner, the object is to build a society of "thinking laborer" and "laborious thinkers," that may be united in their common thoughts and shared experience and provide a firm and lasting foundation for democracy. In the meantime, and as a result of creating a divided educational system with differing objectives we can observe how deeply divided our nation has become. 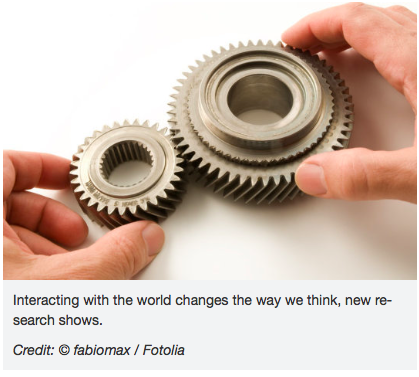 Make, fix, create, and increase the likelihood that we find common ground in all learning likewise. In my home shop, I've been making boxes with veneered tops. Some will be given as wedding gifts, and at least two will be used to test the Infinity Dovetail Spline system. This morning I'll take my Dewalt Scroll Saw to Clear Spring School, so I can demonstrate making patterned veneered tops for my students in high school. They will be given a choice of either making veneered boxes, working on the lathe, or making practice swords for martial arts. This blog serves as a tool for my teaching. It helps me to plan my day, but it also serves as a memory device, and a means for reflection on what I've done and where to go next. Einstein had said that his pencil and he were smarter than he was. Jerome Bruner discussed the ways we offload cognitive content into our surroundings. Einstein and Bruner were thinking more about the way we write things down in notebooks and chalkboards and thereby keep them at hand. 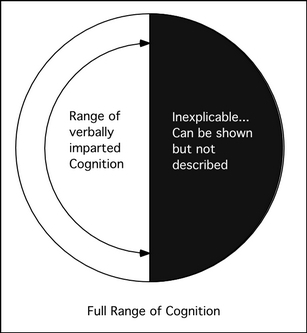 But even the way we organize tools in a wood shop or steps in a procedure are expressions of cognitive development and capacity. The brain is much more than a storehouse of information. It is a processing center for all that is at hand. Bob Dylan was asked by a reporter about his long hair and he told how some people have their long hair on the inside where it fuzzies their thinking. Early educators had been concerned that students were becoming "one-sided," meaning that they were being overburdened with academic content, and thus missing out on what it meant to be a fully functioning human being. Most schooling involves the absorption and supposed retention of information that children can do nothing with. Making has a way of fixing a few things. Make, fix, create, and build a future in which others are empowered to learn likewise. Wooden clocks and telling time. Yesterday in the school wood shop I made wooden clocks with my first, second, and third grade students. They've been studying telling time, and had made paper clocks in class, but wooden clocks that you've made and decorated yourself, carry lasting lessons. One student did not need the lesson, as he was already good at reading the time from a normal clock. I suggested he make one for his younger sister. But he decided to stamp his name on his anyway, and he can still use it to help his sister learn to tell time. The students are proud of their work, and I hear from other teachers at all grade levels that wood shop is their favorite thing in school. In the photo note the happy face made of tiny nails on the new airplane. Would you not have wanted to have made that yourself? When the clocks were done, my students asked, "Can we make something more?" It's what happens when children learn to use real tools and real materials to make things that interest them. Is it to much for me to repeat the principles of Educational Sloyd over and over again, and may I do it without boring my readers and driving you all nuts? Have I gone off the deep end? Use this as a simple checklist in every area of education. Even in college. In every field of study, regardless of how abstract, effective learning demands that it be brought home to the hands. And students of all ages love learning when it is real and fulfills their most natural inclinations, which include being of service to family and community. My fourth, fifth and sixth grade students have been learning to turn on the lathe, and one of the most challenging things is to get the mind to slow down so that the hands can take greater control. Moving the lathe tool helter-skelter will not do. In fact, turning is a form of deliberation and meditation, and to surrender oneself to the process is a cure for the kinds of stress that ails students of all ages. Make, fix, create, and extend the notion of hands-on learning to others that they might find joy. Some days I find I have almost nothing to say, so I start writing to see what comes out. When they cut down all the trees, they looked around and discovered something important was missing. In remediation, and redemption of their own souls, and seeking a renewed sense of beauty in their lives, they began planting trees. It is an age old pattern. Human beings seem to run hot and cold to the extremes. We did the same thing with the elimination of manual arts. First they made the colossal error of thinking that only a few children needed tactile engagement in the real world, making beautiful and useful things as others would be shuffled off to college. Then when a furor arose that some children were being singled out for abandonment in "the trades," while others would get the glories of a college education, it became a mantra, that "all children would go to college." (whether it led to a degree or not). A few years back, the superintendent of schools in Rogers, Arkansas had told her teachers that they will have failed every child who does not go on to receive a 4 year college degree. That sort of thinking didn't work out so well. Being schooled primarily in the abstract, without manual training and the arts left a large number of students disaffected and disengaged. Some dropped out of high school. Some dropped out of college. Others attended college, but became burdened by debt for educations they will not use. So without the trees to humanize the landscape, education had become a dismal place indeed. Have we turned a corner, and are we ready to allow children to do real things in schooling? Or shall we just put pictures of trees on our iPhone screens and let it go at that? Today, the wood shop at Clear Spring School is a mess, and I must go in to straighten things up. This afternoon, I'll have students grades 1 through 6. The older ones are beginning instruction on the lathe. Make, fix, create, and increase the propensity to learn likewise. Yesterday my 7th and 8th grade students helped in the garden, as we strengthen the garden fence, and filled the compost bin students and I had made last year. It had been neglected. In fact, the whole garden had been. Steel tomato cages had been thrown aside and trampled, so they will need to be replaced. In the compost bin, we gathered wood chips and organic debris so it could be properly composted and turned into dirt for the garden beds. My upper elementary school students worked on the lathe while one, having been dissatisfied with his first attempt to make a pencil holder asked for help in making one where cuts were square and edges aligned. His second attempt was better, and if he will try again, a third attempt will be better yet, provided the level of attention and care increases in the process. Some things on the surface may appear simple and mindless when in reality they are not. When children are proclaimed wonderful without having been tested by real circumstances and without having earned self-respect on their own and by their own efforts, it can mystify them when things don't automatically work out. It is not unusual for human beings to have a form of magical thinking in which we just do things and expect the world to comply. I remember being in pottery class, having the teacher suggest that clay has to be thin to survive the drying and firing process and then having things explode in the kiln. Was I not listening? I can assure you I had not fully understood, as I had assumed myself so blessed in my creativity as to avoid the actual circumstances of reality. That is the real dirt. In an age in which we have delivered to us, so many fancy things with the actual environmental and social costs and consequences hidden from view, I have deep concerns. Perhaps the most important objective we can develop in schools is for students to be fully engaged and to learn to care: To care about themselves (honestly earned esteem) and for each other, and for the planet in which we are engaged together. Today I will be developing a tools spreadsheet... things that need to be ordered for the ESSA wood shop. Use the comments section of the blog or email to ask questions about box making, and you'll get answered in the blog. If you have a question about woodworking in general, I can help there, too. On Saturday I finished vacuum veneering top panels for boxes, and making trim strips from multi-colored veneers to use as borders around the panels as they are glued into recesses cut in the box sides. 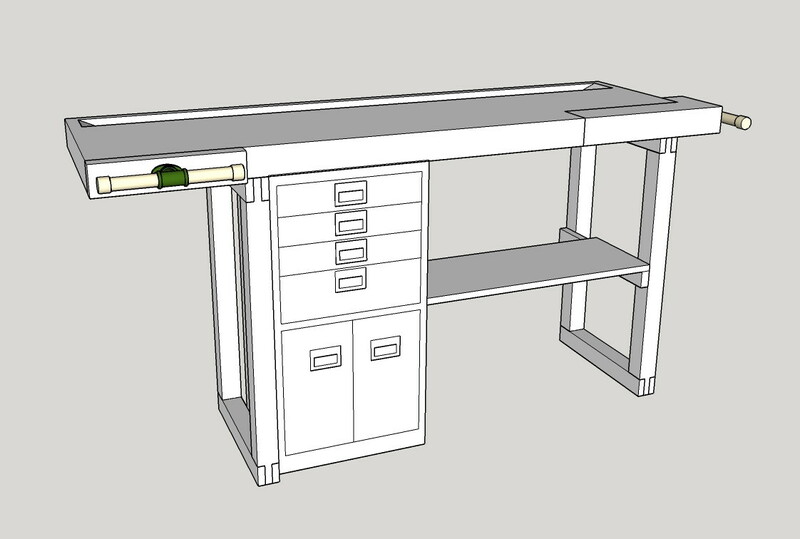 For our local Community Center, I am using sketchup to design a reception desk. And today my middle school students and I will finish the fences and install the gate for the school garden. It is always a pleasure to have boxes in the works. One will serve as a test box for using the Infinity Dovetail Spline jig. Others will be given as wedding gifts, or sold on Etsy or one of the small galleries that sell my work. At this point, I've been typecast. Boxes are what I'm best known for, I find pleasure in making them, so carry on with it. Make, fix, and create. Then prove and promote the value of learning likewise. 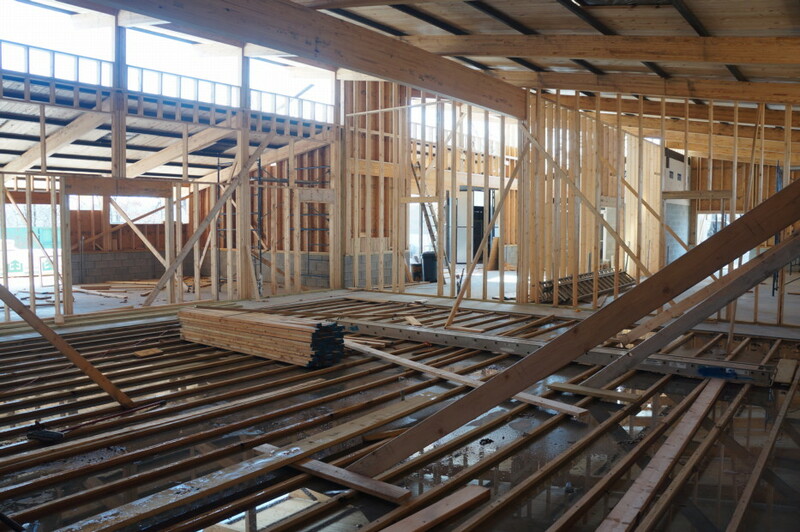 The new wood shop at the Eureka Springs School of the Arts is well underway with the tongue and groove ceiling boards laid in place. Next comes the insulated space between the ceiling and roof, just prior to the installation of the metal roof. I'm not sure how many readers will realize how important this is in my own life. I was one of the founders of the organization, and we have made huge progress in only a few years. I also submitted the original design floorplan to the architect and was a consultant as he developed the building design. Yesterday in my home wood shop I applied veneers to Baltic birch panels to make the tops of veneered boxes. I also spent some time updating my BoxMaking101 website, and adding a link to my BoxMaking101 blog that allows readers to receive new blog posts by email. The new ESSA wood shop is amazing already. The photo is taken from inside the north wall of the machine room, and shows the bench room on the left, the reception/gallery area at center, and the lathe room at right. The machine room floor is designed with furring strips to support plywood. The electricity will be run in the floor and some cushioning from the resilient floor will make things easier for the knees, hips, and backs of our students. Make, fix, create, and increase the likelihood that others choose to learn likewise. Yesterday my high school students and I worked on the school garden, adding a top rail to stabilize the fence so the gate we made in wood shop last year can be mounted. It was a lovely day, and all my students were glad to spend a bit of time outside. While some students did carpentry work under my direction, others did a general clean up, removing plant growth remaining from last year, and piles of leaves that had accumulated during the fall. I had a dream last night that I was attending an educational conference, and having gone through one convoluted and contrived lesson after another, I suggested that it would be far easier and effective to make education real, and to let children participate in real life. I doubt that my ideas were well received. But we all learn in the same manner. We get engaged in what appeals to us and with some support may be led deep. Froebel called it self-activity. And there is no more effective means of learning or of being taught. In addition to the school garden, I worked on boxes, and visited the new wood shop under construction at the Eureka Springs School of the Arts. In box making, I am gluing veneer to Baltic birch panels using a vacuum lamination technique. Thee panels will be inset to form the tops of lovely boxes. I'll remind you of my box making blog and box making website. The website has been modified to be a wordpress site, available now on iPhones and tablets, and easy enough to edit that I can do it myself. At these locations, you can ask box making questions, and get answers. Sometimes the products made in wood shop are not completed until the children have had time to apply color. These airplanes, having been made in wood shop and carried back to class for application of color are ready to fly to the heights of imagination, just as my own have been carried aloft, by the opportunity to make useful and beautiful things from wood. Yesterday I visited the Grizzly tools headquarters to get my hands on some of the types of equipment I'll be ordering for the new wood shop at the Eureka Springs School of the Arts. I also talked to a tools production specialist at Woodcraft about manufacture of my dovetail marking jig, and took the first very tiny steps toward founding the Museum of Eureka Springs Art. Today I will have my high school students in the wood shop. The new wood shop at the Eureka Springs School of the Arts is on schedule and on budget, and I marvel at how some contractors and construction workers are able to gather such a large project into such a manageable view that they can pull such things off. Experience in the real world helps. I plan to visit the site later in the day, and with the roof deck boards in place, I'll be able to get a sense of how the building will look as equipment is moved into place. Then, in order to complete the installation of wiring, I'll have to describe where each major tool will fit, and what its power requirements are. I was awake part of the night knowing that the process of acquiring equipment and finalizing workbench designs must begin soon, and that's a part of the process in which I am required to take the lead. Yesterday in the Clear Spring School wood shop, my students did some lovely work. One, in 6th grade, finished a nice box for her teacher. In designing the lid, I asked her whether it should be symmetrical or asymmetrical. You can see her choice. The wood burning was her first attempt, so she practiced first. Make, fix, create, and increase the opportunities for all children to learn likewise. Yesterday I sent a very large box of box guitars to my editor in Nashville, so pictures can be taken for the cover and for the beginning of each chapter. I also began making almost a dozen boxes, some of which will be used to demonstrate and test the Infinity Dovetail Spline system for a review in Fine Woodworking. Today in the wood shop at the Clear Spring School, my upper and lower elementary school students will be working on a variety of projects, and because they are all at different levels of skill and understanding, it makes sense for me to allow them to work at their own pace, and on projects drawn from their own longings. I received new pliers in the mail yesterday that will be helpful whenever my students need to pull nails. Today I will introduce these special nippers, and encourage them to bend nails and see how they work. The important point is to shift as much of the load as possible to the kids, so that they take full ownership of the things they make and the processes through which they are made. 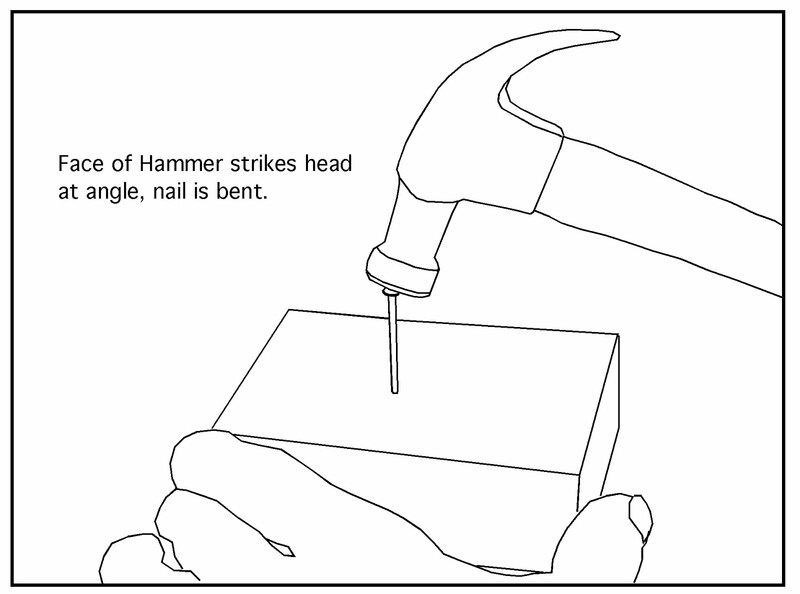 The illustration is one I made showing that if the hammer strikes an indirect blow, the nail bends. 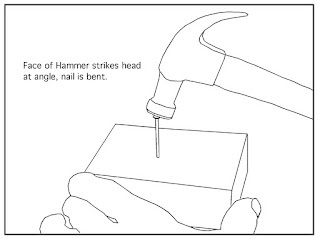 If children know how to bend a nail, they may also be more attentive to hammer angle when they want one to go in straight. A friend of mine is beginning work on her PhD at Cambridge, with her special area of interest being "tinkering." Not long ago, universities in Finland and Sweden were being encouraged to abandon their support of advanced degrees in Educational Sloyd in order to conform to European University Standards. So let's hope the tide has turned. Let them call it by a new name, as long as the gist is the same. Children learn best hands-on, by making real things of useful beauty in service to family, community, and their own imaginations. There actually is a difference between what has been called "tinkering" and woodworking in that woodworking relies on materials drawn from the natural environment, and therefore has the potential of connecting students to a deeper and more primal understanding of reality. In an age in which children know far too little about the natural environment, it makes great sense for them to work with real wood. EPA be abolished, and the book makes me wonder what they could have in mind. For some, the EPA is synonymous with regulation, and regulation is synonymous with impediment to free reign of corporate intent, and they fail to see that corporations can go deeply astray in their quest for short term gain. The underlying purpose of incorporation is to shield investors from liability, so when corporations do really bad things, as they have so many times in the past, the poor, the environment, and the tax payer are left holding the bag. In contrast, when a human being does something stupid and destructive, the scale of the action is far smaller in scale than what a corporation would do, and the individual involved will be held responsible. So despite what some Republican lawmakers and the current administration believe, the EPA is a very, very good thing. The EPA really grew through the efforts of Senator Gaylord Nelson from Wisconsin, as the nation faced incredible problems with smog, release of dangerous chemicals, and water dirtied by industry. Nelson was the founder of Earth Day which really found its origins in the National Arbor Day, which was launched in celebration of trees. So trees are really at the center of it all. Trees were seen as one of the remedies to man-made pollution and Jonnes' book reminds us that human beings have long treasured our relationship to trees and to our forests, and that trees within urban environments humanize our surroundings, making them habitable. Yesterday in wood shop at the Clear Spring School, we had a new first grade student. I asked my more experienced students to take him under their wings and help him to get started, knowing the rules and all, with regard to safe work. Part of the challenge of woodworking is for students to learn to investigate on their own. Why does this work? Why does this not work? And then, having formed hypotheses to test their propositions in their own hands. Wood presents some real obstacles to creative work and only through examination of its properties can one get it to bend to one's will. One of the important tools that you will want to introduce to your students is the try square. You can buy metal ones from any number of retail outlets in your community or online for as little as $7.00 ea. More expensive ones might cost as much as $15.00. But there is satisfaction in making them yourself. These are easy to make by cutting a slot mortise on the end of a block of wood for the blade to fit. The photo shows an easy set up using a sled and stop block, and once set up, you can cut hundreds if you like. It is important to use a very accurate square to check to make sure the blade is aligned squarely in the slot as it is glued in place. And it is important to accurately plane or saw the blade stock so its thickness matches the width of the saw kerf. I use a saw blade with a square top cut, so that the wooden blade will nest very accurately and securely in place. As it is assembled, check that the blade is square to the body. Is this wooden square as useful as a factory made steel square? Yes, it can be, and its light weight means that if it is dropped, it is not as likely to hurt a toe, or be knocked out of square from impact with the hard floor. The great thing of course is that it costs almost nothing. You can make several at the same time and students can help in the making of it. Use the drill press and Forstner bit to drill a hole in the handle so that it can be hung up when not in use. When my students make tool boxes, they also want to make a few tools to go in it. The square is a great addition, even if they don't know its importance yet. Make, fix and create. Insist that others have the opportunity to learn likewise. how to bend a nail. Readers, particularly those interested in starting woodworking programs in school and coaching kids in the process of making things may enjoy an earlier post on the subject of hammers and hammering before I move on. How to bend a nail. The post explains why nails bend, and I can assure you, it's not through some malicious will of their own. Nail bending is due to operator error and inattention. It can also be caused by attempting the impossible, like driving a nail into a hard knot. Cultivating the powers of attention and observation are of extreme importance in school and in life, and there should be little distinction between the two. School and life, that is. Observing why nails bend and then adjusting technique so they do not bend is a valuable lesson involving both physics and physiology. I have learned that while we've set things up so my blog posts are being posted for facebook readers on my facebook business page, pictures come through there in a restricted manner, with only one image making it to the page and often away from its intended location. So if you are following this blog on facebook and a post appears confusing or incomplete, go to WISDOMOFHANDS.BLOGSPOT.COM and you can read it as written and intended. My wife Jean has been editing the facebook posts to help them be more coherent, but sometimes the challenges are too great. If you like what's written here, there are over ten years worth of posts on the blogger site. My illustration on this page shows the real nature of learning which I am compelled to repeat over and over again. 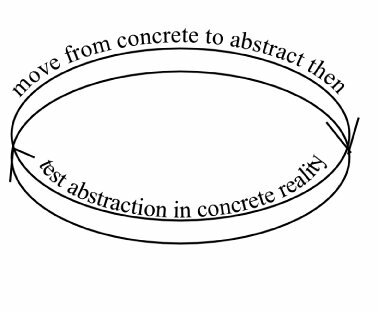 This simple diagram is based on the theory of progressive education passed to us and refined through centuries of observations by noted educational theorists. I can name them if you want to study them yourself. The relationship between the concrete (real) and the abstract (academic) provides a clear and compelling rationale for insisting that the hands be purposely engaged in learning. The lack of adherence to this principle explains why we've gotten into such a terrible mess with widespread acceptance of fake news and the like. Today I intend to begin preparing materials for my high school students to make veneered boxes and to make a few boxes myself to test an Infinity dovetail spline system for Fine Woodworking Magazine. In my review of the Infinity system, I could simply say, "Oh, this is nice." Or I could test it by making a box and base my writing on its actual application in the wood shop. Which would be honest and true? If you don't get the difference, I'm losing hope. I have been making bridges and nuts and stringing the last of my box guitars to get them ready to send to my publisher. The last one, a six string, will be completed today. I have done over a dozen box guitars and two ukuleles in the course of writing and photographing this book (tentatively entitled The Boxmaker's Guitar Book), and still have parts for some that can be assembled if the inclination comes back. By tomorrow, the guitar making will be complete and I'll be ready for serious clean up and whatever writing chores come next. I submitted my new student saw horse to Fine Woodworking as a possible article and they asked that I submit what I've written about it in the blog as a word document they could pass around for consideration. They, and every woodworking magazine, need to make an investment in assuring there will be young woodworkers to uphold our creative tradition and share the fun we have. Kids need to know they can make stuff and adults need to know kids can be safe doing so. The Shaker box in the photo is walnut and cedar. All of the students have chosen to keep their boxes unfinished on the inside so that the smell of cedar will remain and entice. No box is perfect, but each is useful, and each serves as evidence of a student's growth. My students have shown satisfaction in their finished work. One student was concerned that his had small defects, but decided his good friend Joe would find a good use for it. Joe is one of my former students, no longer at Clear Spring School, but who still has the bug to make things. Did he catch it in my class? I can't say for sure. Even a single moment, creatively engaged, can change one's life for a lifetime. I added a small plastic plate (as shown) to my new children's saw horse so that the end will be protected as square cuts are made. It can be replaced when it gets worn without taking the whole thing apart. In addition, after a reminder from René of the importance of pliers in a school's woodworking tool kit, I went on eBay and bought the pliers shown in the photo below. Please add these to the necessary tools for a school wood shop. They cost $5.95 each postage paid and a school shop would benefit from having one pair for every 3 or 4 kids. 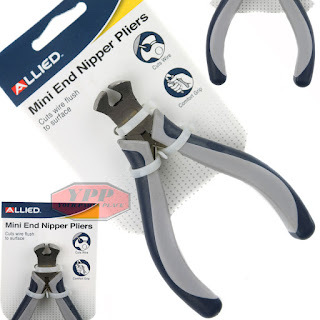 These nippers differ from regular pliers in that they bite flush with the stock, making it relatively easy to grab a bent nail, and the curved jaws roll along the surface of the material, lifting and prying the nail as they do so. In fact, pulling nails is one of the recommended uses for these pliers. They can also cut very small nails if necessary close to the surface of the wood. Just 4 inches overall length, they are small enough to be handled by one of my first grade students, and the more things my students can do safely for themselves, the better. I showed my new kid's saw horse/bench to students who are now in high school, that had begun working in the school wood shop while in first grade. One observed that it was complex and would take our students some time to figure it all out. With practice the kids will get it, and they don't have to learn it all at once. Make, fix, and create, that others may be inspired to learn likewise. My students tested my new student saw horse/bench and we made some refinements. One was the addition of a removable wooden hand screw that is reversible to hold irregularly shaped stock or can be used for assembly and planing. The other was that I needed to make a relief cut to allow ripping of stock to take place from the back side. As you rip with a Japanese pull saw, the blade pulls toward you, and a hand braced on the sawhorse at the back stabilizes the whole operation. This relief cut can be observed by comparing photo 5. with photo 2. Use the hand screw outboard to hold angled stock for sawing. Use the right side and ledger strip with "c" clamp to hold stock for square crosscuts. Use the hand screw mounted inboard to hold parts for assembly. In this case the hand screw serves admirably as a vise. Mount the stock with "c" clamps to the left side of the bench and saw from behind. Note the cut out that allows for the saw to travel without hitting the hand. The last photo shows the hand screw mounted with carriage bolts and plastic knobs. One of the problems with the children's benches we've used at Clear Spring School is the cost of vises. We started our program with some capital that other schools may not have. A good vise can run twice as much as I invested in this bench. It was made in just a bit more than an hour and so there can be few excuses for not putting students to work making beautiful and useful things. The lumber cost $10.70. The large hand screw and clamps were $25.00. You can see that I'm working toward a cost per student list of tools for those hoping to introduce woodworking in their school. For those hoping to simply add woodworking as a center in an arts complex, thus expanding the student's creative options, two or three benches might suffice, as all students may not be sawing and building at the same time. Make, fix, create and improve the chances that others learn likewise. I delivered the walnut and white oak dining table yesterday to its new home in Bentonville, Arkansas. It was the first piece of furniture delivered to a newly built home of friends. Today, in addition to my classes at Clear Spring School, I'll write a synopsis of lessons learned building this table to submit to Fine Woodworking as a proposal for an article. I also finished my prototype saw horse that we will test today at school. The twin challenges of safely holding wood as students work, and keeping tools and equipment relatively inexpensive can be met. We must arrange it so that schools have no excuses for depriving children of the opportunities they most need and that their engagement depends on.